The Mexican Cession of 1848 refers to the lands ceded or surrendered to the United States by Mexico at the end of the Mexican–American War. The territory became the states of California, Nevada, Utah and Arizona. It was agreed to in the Treaty of Guadalupe Hidalgo, which formally ended the war (1846–1848) between Mexico and the United States. The treaty was signed on 2 February 1848. The Cession added 500,000 square miles (1,300,000 km2) of territory to the southwestern United States. It also contributed to the United States emerging as a world power in the late the 19th century. Alta California and Santa Fe de Nuevo Mexico were captured soon after the start of the war and the last resistance there was subdued in January 1847, but Mexico would not accept the loss of territory. Therefore, during 1847, troops from the United States invaded central Mexico and occupied the Mexican capital of Mexico City, but still no Mexican government was willing to ratify transfer of the northern territories to the U.S. It was uncertain whether any treaty could be reached. There was even an All of Mexico Movement proposing complete annexation of Mexico among Eastern Democrats, but opposed by Southerners like John C. Calhoun who wanted additional territory for their crops but not the large population of central Mexico. Eventually Nicholas Trist forced the Treaty of Guadalupe Hidalgo, explicitly redefining the border between Mexico and the United States in early 1848 after President Polk had already attempted to recall him from Mexico as a failure. Although Mexico did not overtly cede any land under the treaty, the redefined border had the effect of transferring Alta California and Santa Fe de Nuevo Mexico to the control of the United States. Equally important, the new border also acknowledged Mexico's loss of Texas, both the core eastern portion and the western claims, neither of which had been formally recognized by Mexico until that time. The U.S. Senate approved the treaty, rejecting amendments from both Jefferson Davis to also annex most of northeastern Mexico and Daniel Webster not to take even Alta California and Santa Fe de Nuevo Mexico. The United States also paid $15,000,000 ($482 million in 2016 dollars) for the land, and agreed to assume $3.25 million in debts to US citizens. While technically the territory was purchased by the United States, the $15 million payment was simply credited against Mexico's debt to the U.S. at that time. The Mexican Cession as ordinarily understood (i.e. excluding lands claimed by Texas) amounted to 525,000 square miles (1,400,000 km2), or 14.9% of the total area of the current United States. If the disputed western Texas claims are also included, that amounts to a total of 750,000 square miles (1,900,000 km2). If all of Texas had been seized, since Mexico had not previously acknowledged the loss of any part of Texas, the total area ceded under this treaty comes to 915,000 square miles (2,400,000 km2). Considering the seizures, including all of Texas, Mexico lost 54% of its pre-1836 territory in the Treaty of Guadalupe Hidalgo. 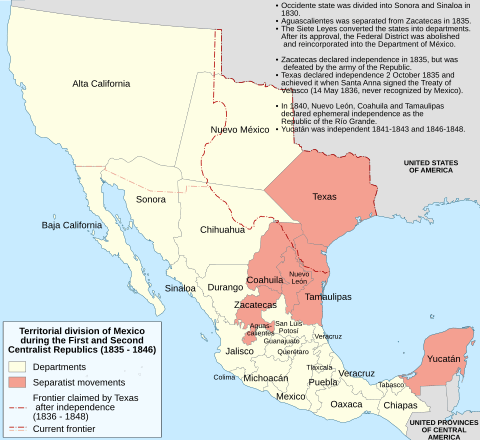 For only fifteen years from 1821 (when Mexican independence was secured) and the Texan Revolt in 1836, the Mexican Cession (excluding Texas) formed approximately 42% of the country of Mexico; prior to that, it had been a part of the Spanish colony of New Spain for some three centuries. Beginning in the early seventeenth century, a chain of Roman Catholic missions and settlements extended into the New Mexico region, mostly following the course of the Rio Grande from the El Paso area to Santa Fe. The Wilmot Proviso, which was created by Congressman David Wilmot, banning slavery in any new territory to be acquired from Mexico, not including Texas which had been annexed the previous year. Passed by the United States House of Representatives in August 1846 and February 1847 but not the Senate. Later an effort to attach the proviso to the Treaty of Guadalupe Hidalgo also failed. Failed amendments to the Wilmot Proviso by William W. Wick and then Stephen Douglas extending the Missouri Compromise line (36°30' parallel north) west to the Pacific, allowing slavery in most of present-day New Mexico and Arizona, Las Vegas, Nevada, and Southern California, as well as any other territories that might be acquired from Mexico. The line was again proposed by the Nashville Convention of June 1850. The Mormons' proposal for a State of Deseret seizing areas from portions of the Mexican Cession but excluding the largest populations in Northern California and central New Mexico was considered unlikely to succeed in Congress, but nevertheless in 1849 President Taylor sent his agent John Wilson westward with a proposal to combine California and Deseret as a single state, decreasing the number of new free states and the erosion of Southern parity in the Senate, while legitimizing The Church of Jesus Christ of Latter-day Saints. Senator Thomas Hart Benton in December 1849 or January 1850: Texas's western and northern boundaries would be the 102nd meridian west and 34th parallel north. Senator John Bell (with assent of Texas) in February 1850: New Mexico would get all Texas land north of the 34th parallel north (including today's Texas Panhandle), and the area to the south (including the southeastern part of today's New Mexico) would be divided at the Colorado River (Texas) into two slave states, balancing the admission of California and New Mexico as free states. First draft of the compromise of 1850: Texas's northwestern boundary would be a straight diagonal line from the Rio Grande 20 miles (30 km) north of El Paso to the Red River of the South at the 100th meridian west (the southwestern corner of today's Oklahoma). It quickly became apparent that the Mexican Cession did not include a feasible route for a transcontinental railroad connecting to a southern port. The topography of the New Mexico Territory included mountains that naturally directed any railroad extending from the southern Pacific coast northward, to Kansas City, St. Louis, or Chicago. Southerners, anxious for the business such a railroad would bring (and hoping to establish a slave-state beachhead on the Pacific coast), agitated for the acquisition of railroad-friendly land at the expense of Mexico, thus bringing about the Gadsden Purchase of 1853. Area Mexico ceded to the United States in 1848, minus Texan claims. 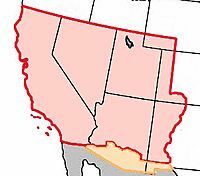 The Mexican Cession consisted of present-day U.S. states of California, Nevada, Utah, most of Arizona, about half of New Mexico, about a quarter of Colorado, and a small section of Wyoming. Mexican Cession Facts for Kids. Kiddle Encyclopedia.